In addition, English has many Arabic loanwords, some directly, but most via other Merranean languages. Examples of such words include admiral, adobe, alchemy, alcohol, algebra, algorithm, alkaline, almanac, amber, arsenal, assassin, candy, carat, cipher, coffee, cotton, ghoul, hazard, jar, kismet, lemon, loofah, magazine, mattress, sherbet, sofa, sumac, tariff, and zenith. Other languages such as Maltese and Kinubi derive ultimately from Arabic, rather than merely borrowing vocabulary or grammatical rules. Although Modern Standard Arabic (MSA) is a unitary language, its pronunciation varies somewhat from country to country and from region to region within a country. The variation in individual "accents" of MSA speakers tends to mirror corresponding variations in the colloquial speech of the speakers in question, but with the distinguishing characteristics moderated somewhat. Note that it is important in descriptions of "Arabic" phonology to distinguish between pronunciation of a given colloquial (spoken) dialect and the pronunciation of MSA by these same speakers. Although they are related, they are not the same. For example, the phoneme that derives from Classical Arabic /ɟ/ has many different pronunciations in the modern spoken varieties, e.g., [d͡ʒ ~ ʒ ~ j ~ ɡʲ ~ ɡ] including the proposed original [ɟ]. Speakers whose native variety has either [d͡ʒ] or [ʒ] will use the same pronunciation when speaking MSA. Even speakers from Cairo, whose native Egyptian Arabic has [ɡ], normally use [ɡ] when speaking MSA. The [j] of Persian Gulf speakers is the only variant pronunciation which isn't found in MSA; [d͡ʒ~ʒ] is used instead, but may use [j] in MSA for comfortable pronunciation. Another reason of different pronunciations is influence of colloquial dialects. 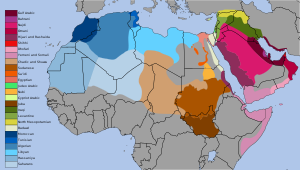 The differentiation of pronunciation of colloquial dialects is the influence from other languages previously spoken and some still presently spoken in the regions, such as Coptic in Egypt, Berber, Punic or Phoenician in North Africa, Himyaritic, Modern South Arabian and Old South Arabian in Yemen and Oman, Aramaic and Canaanite languages (including Phoenician) in the Levant and Mesopotamia. The phoneme /d͡ʒ/ is represented by the Arabic letter jīm (ج‎) and has many standard pronunciations. [d͡ʒ] is characteristic of north Algeria, Iraq, also in most of the Arabian peninsula but with an allophonic [ʒ] in some positions; [ʒ] occurs in most of the Levant and most North Africa; and [ɡ] is used in most of Egypt and some regions in Yemen and Oman. Generally this corresponds with the pronunciation in the colloquial dialects. 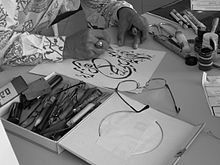 In some regions in Sudan and Yemen, as well as in some Sudanese and Yemeni dialects, it may be either [ɡʲ] or [ɟ], representing the original pronunciation of Classical Arabic. 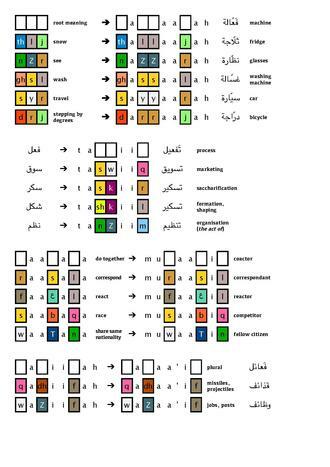 Foreign words containing /ɡ/ may be transcribed with ج‎, غ‎, ك‎, ق‎, گ‎, ݣ or ڨ, mainly depending on the regional spoken variety of Arabic or the commonly diacriticized Arabic letter. Note also that in northern Egypt, where the Arabic letter jīm (ج‎) is normally pronounced [ɡ], a separate phoneme /ʒ/, which may be transcribed with چ‎, occurs in a small number of mostly non-Arabic loanwords, e.g., /ʒakitta/ 'jacket'. ك‎ /k/ usually retains its original pronunciation, but is palatalized to /t͡ʃ/ in many words in Israel and the Palestinian Territories, Iraq, and countries in the eastern part of the Arabian Peninsula. Often a distinction is made between the suffixes /-ak/ ('you', masc.) and /-ik/ ('you', fem. ), which become /-ak/ and /-it͡ʃ/, respectively. In Sana'a, Omani, and Bahrani /-ik/ is pronounced /-iʃ/. ^ a b "Arabic – Ethnologue". Ethnologue. Simons, Gary F. and Charles D. Fennig (eds.). 2018. Ethnologue: Languages of the World, 21st ion. Archived from the original on 5 January 2016. Retrieved 21 February 2018. ^ Semitic languages: an international handbook / ed by Stefan Weninger; in collaboration with Geoffrey Khan, Michael P. Streck, Janet C. E.Watson; Walter de Gruyter GmbH & Co. KG, Berlin/Boston, 2011. ^ a b c d e f g Shrivtiel, Shraybom (1998). The Question of Romanisation of the Script and The Emergence of Nationalism in the Middle East. Merranean Language Review. pp. 179–196.